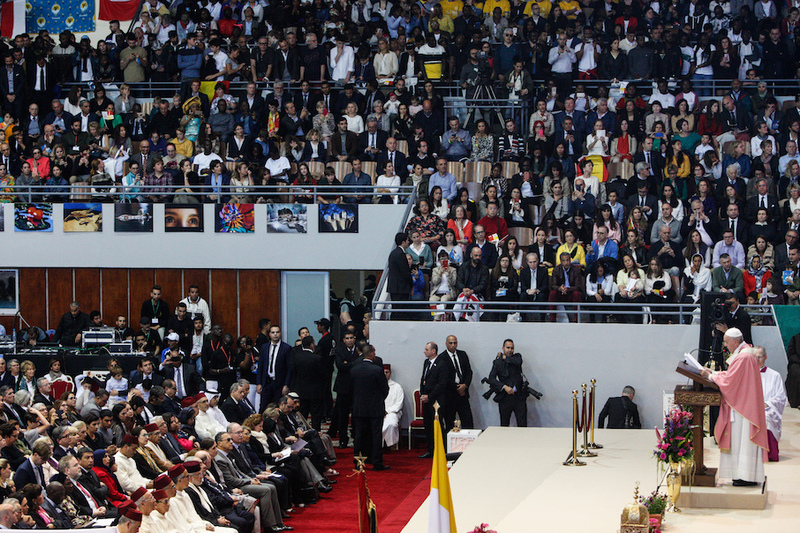 At the end of his two-day apostolic visit to Morocco, Pope Francis presided over a Holy Mass in the Prince Moulay Abdellah sports complex in Rabat on Sunday, May 31. 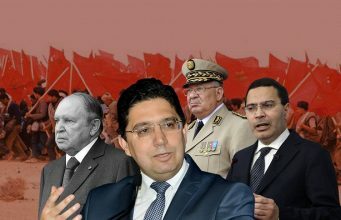 Photo by Sebastian Bouknight: Morocco World News. 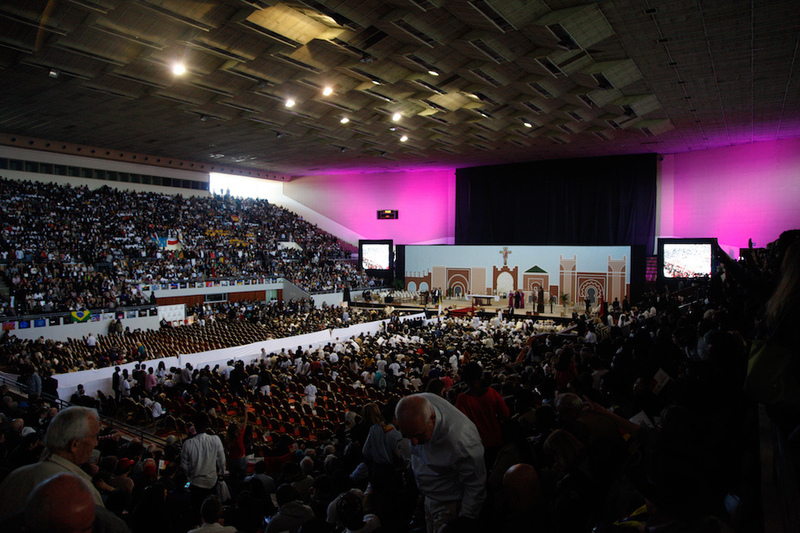 Rabat – In the stadium-turned-church, a grand altar stage dominated, backed by images of Moroccan architecture and a large cross. 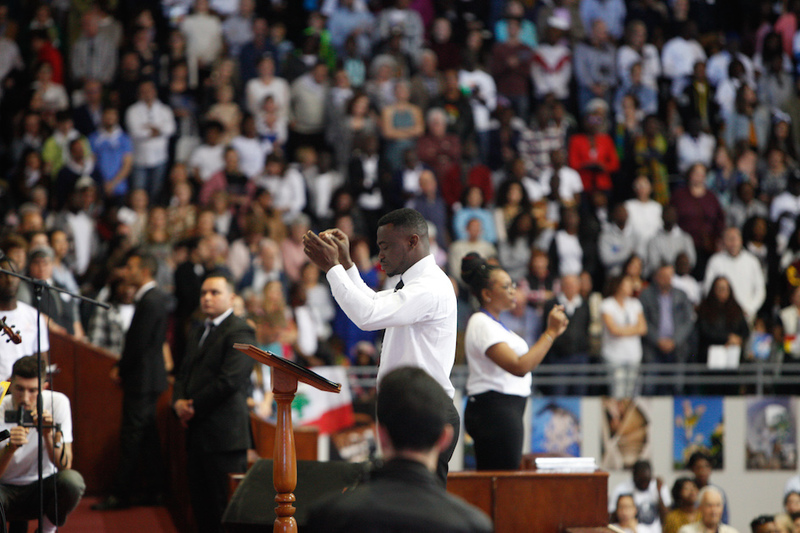 The space brimmed with some 10,000 worshippers and others who came for the experience, a stunning number considering the country’s small Christian community. 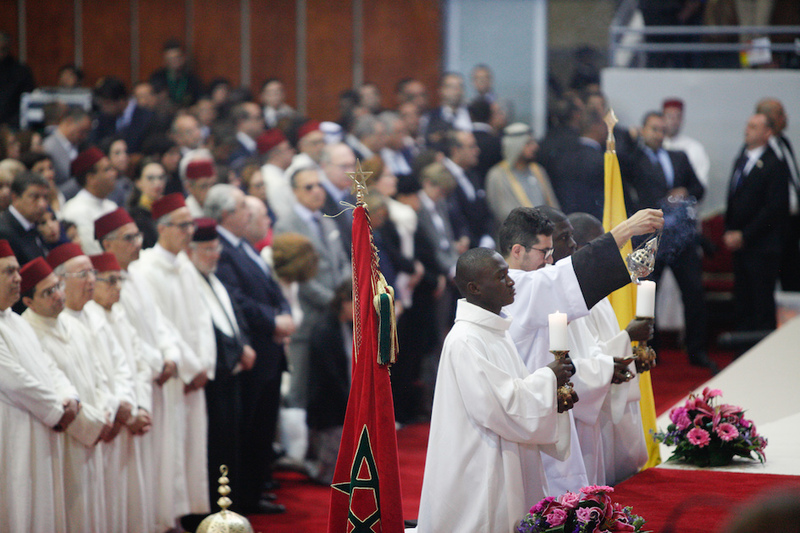 The Mass drew Christians from across Morocco and beyond. 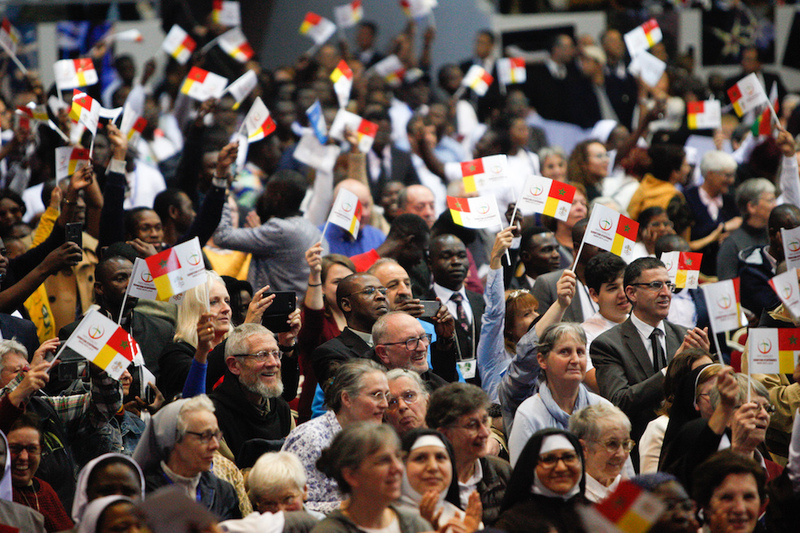 Flags of Spain, Brazil, Lebanon, and Poland were but a few among many. 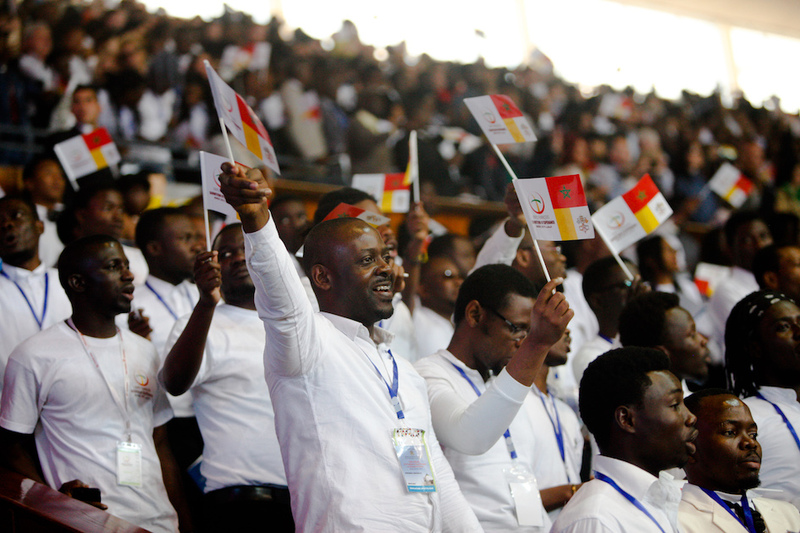 Mexicans, Congolese, Cameroonians, Angolans, and Italians shared the stands. 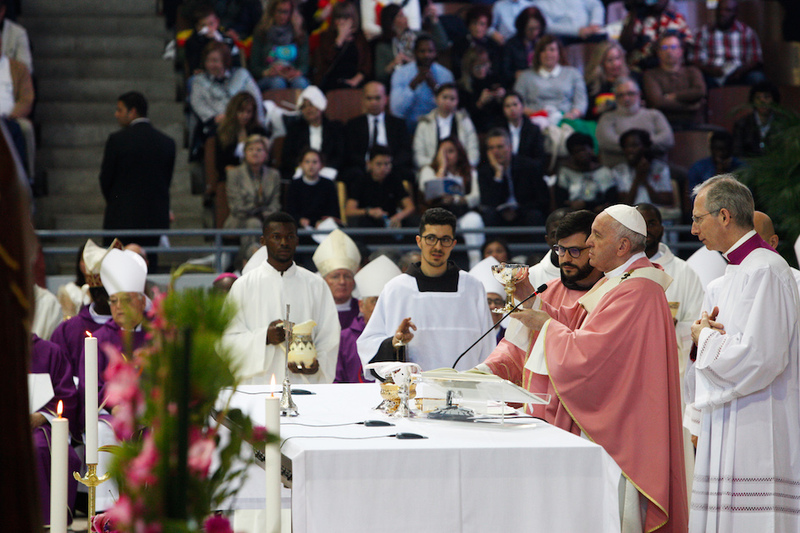 Readings and prayers were offered in six languages, including Arabic. 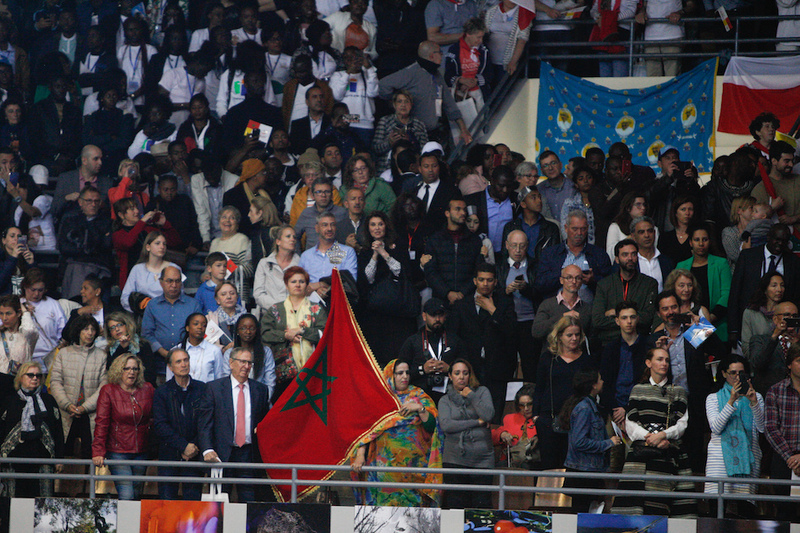 A Saharawi woman held an enormous Moroccan flag. 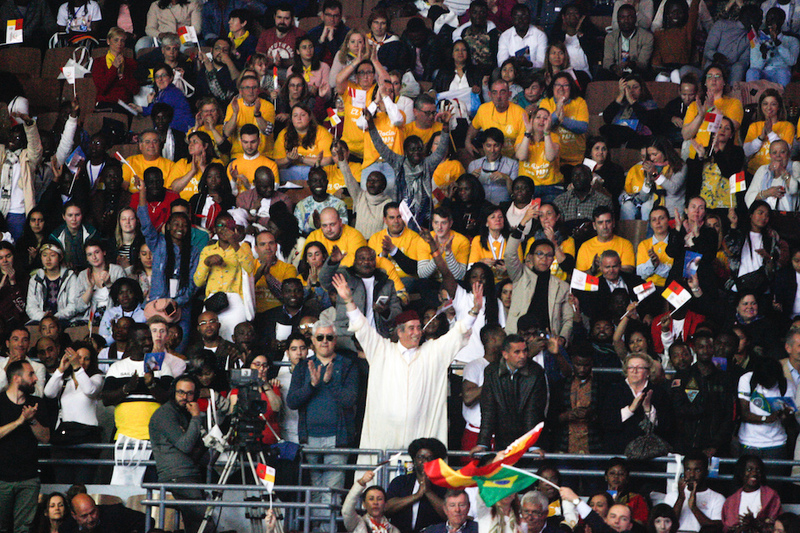 When large monitors showed the pope’s convoy arriving at the stadium, the crowd erupted in excitement: “Il arrive!” “El llegó!” “He’s arrived!” Spirited shouts of “El Papa! 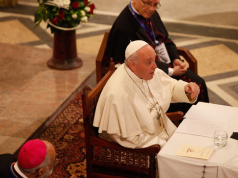 Viva!” punctuated the Mass. 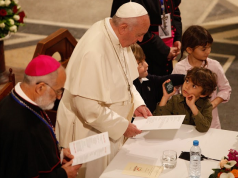 Many of those who managed to touch the pope’s arm as he walked down the aisle swooned with joy. 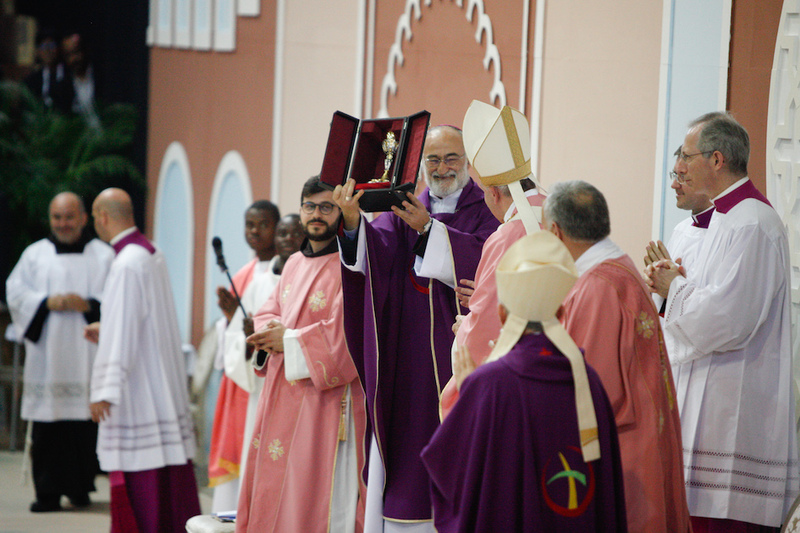 A chorus of several hundred sang sober Latin liturgy and joyful, dancing hymns. 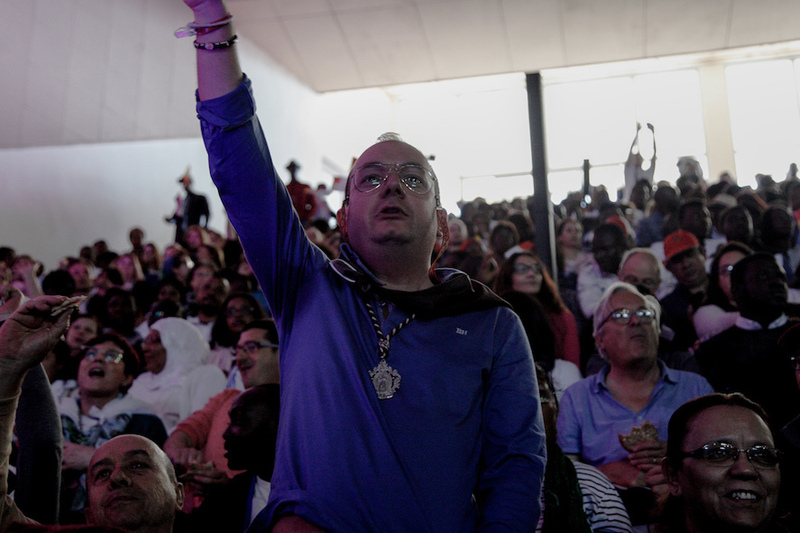 The group was an assembly of singers from parishes across Morocco, who took fleets of buses to meet in Rabat. 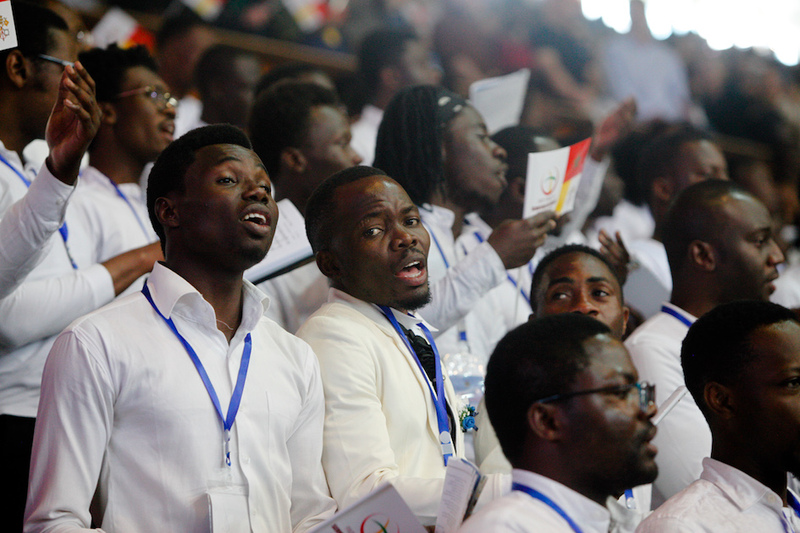 Most of them, like most of Morocco’s Christians, were immigrants, many from sub-Saharan African countries. 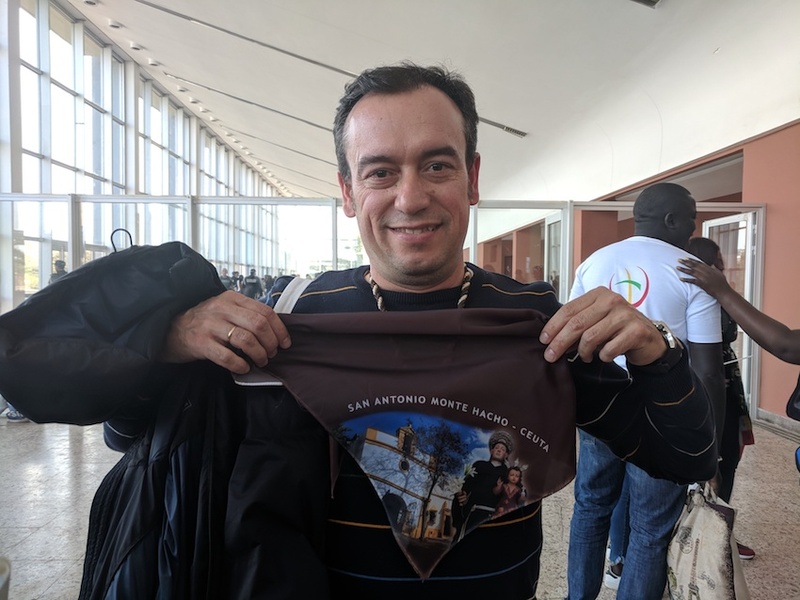 Damien, an architecture student from Burkina Faso now living in Tétouan, was thrilled to experience the mass, and happy to see the pope and King Mohammed VI working together. 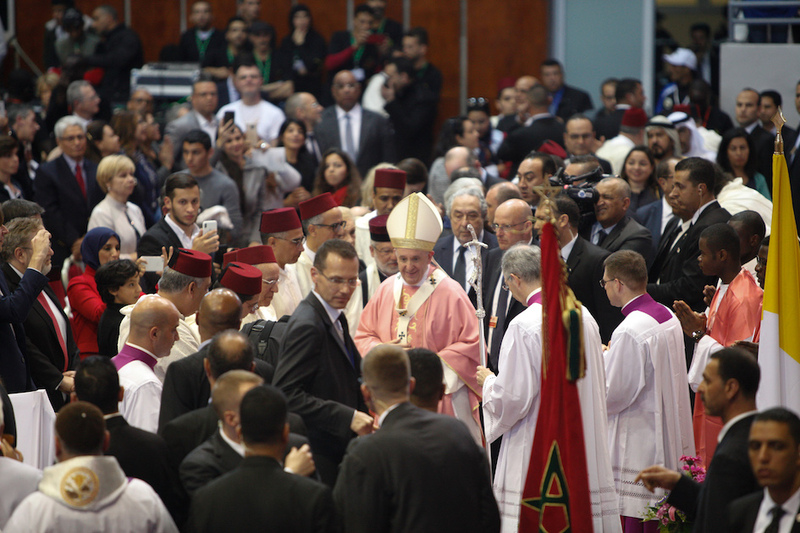 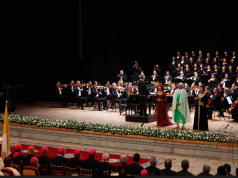 In the stadium, leaders of Morocco’s government, including imams, sat across the aisle from the priests and nuns. 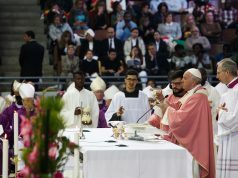 During his sermon, Pope Francis reflected on the Mass’s Bible reading, which told of a jealous son reacting angrily to his father’s joy when his long-absent younger brother returned. 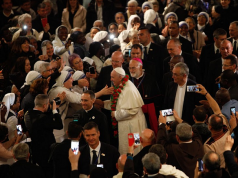 Archbishop of Rabat Cristóbal Lopez Romero thanked the pope for his visit, saying that he hoped Morocco could be a bridge between Muslims and Christians, between North and South, and affirmed the humanity of all migrants. 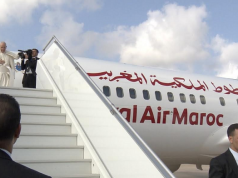 Tens of thousands of sub-Saharan and Moroccan migrants have scaled Ceuta’s fences in recent years, seeking European soil. 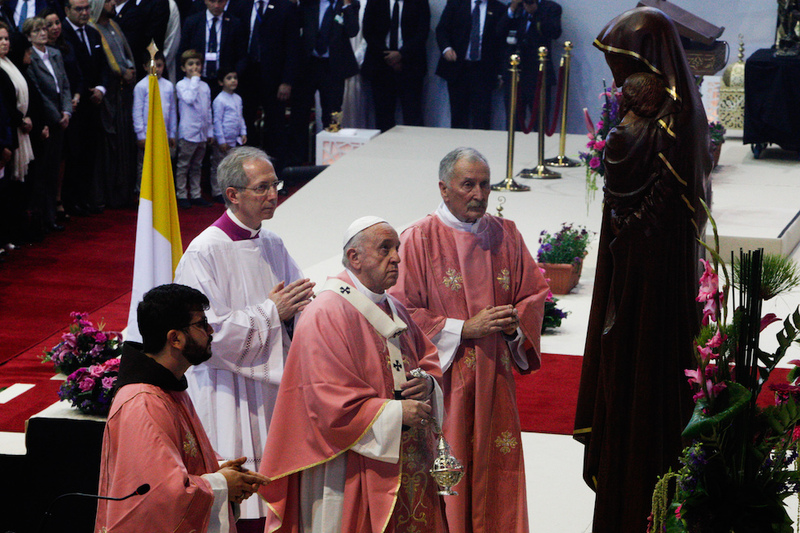 Humane treatment of migrants was a major focus of the pope’s visit to Morocco.